When most people here in the US think of gazpacho, they think of a chunky, tomatoey, thin cold substance that reminds me of bland salsa. However, the authentic dish in Spain is nothing like that. It is creamy, and rich, and delicious. What makes it so? Two things that have been neglected here: bread and olive oil. 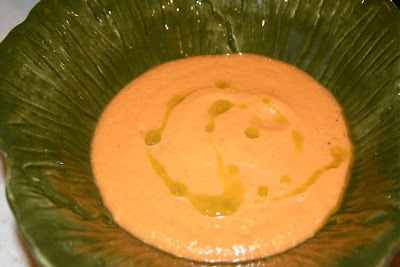 Let me tell you how gazpacho should be. First, let me give credit where credit is due. I got this recipe from Lynne Rossetto Kasper’s America Public Media radio show, The Splendid Table. It was passed to her by David Rosengarten who was a guest on her show recently. David’s recipe can be found here in its entirety. I doubled his recipe and it was more than enough! 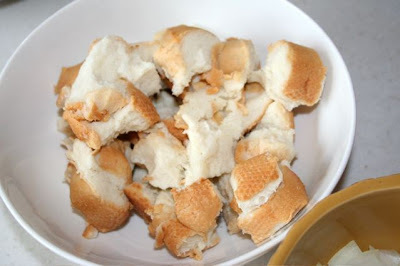 I started with about 4 oz of day old French bread. This was ripped into pieces and soaked with cold water for a couple of minutes. The water was squeezed out. The bread is important as it helps to thicken the soup. 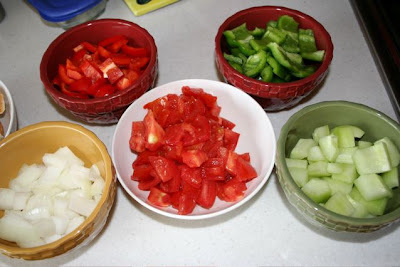 Next I chopped up about a pound of ripe garden fresh tomatoes, a medium sized sweet onion, about a cup and a half of cucumber (peeled and seeded), a large green bell pepper and a large red bell pepper. 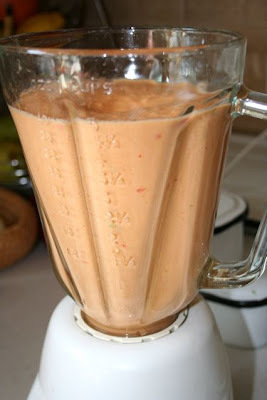 Everything was placed in the blender and 2 tsp of sherry vinegar was added. 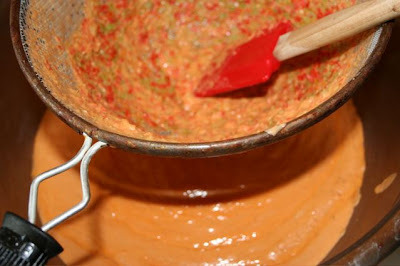 The mixture was puréed while pouring in 1/2 cup of good extra virgin olive oil. That makes it rich and creamy. Once puréed, the mixture was seasoned with salt and pepper and then strained through a seive. The soup was chilled well before serving. I garnished it with more of the basil oil I described in my last post. Thanks everyone for being so patient as I navigate my busy life. I promised to be back with details about my dinner so here you go. My second course was a pasta dish. 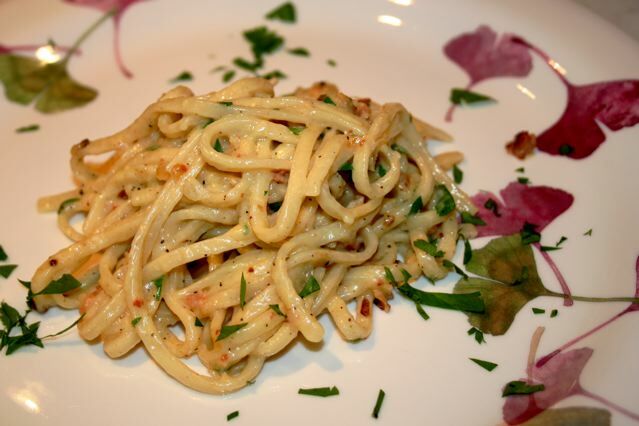 I was inspired to make a carbonara based on a post over at Peter Minakis’ Kalofagas Greek food blog. If you haven’t been there before, you are missing out. I followed his recipe pretty much as written except I doubled it. Instead of Romano cheese I used parmigiano reggiano. I did use pancetta. Worth the extra cost, definitely. The pasta was placed in a large pot of salted boiling water to cook. In a large pan was added the pancetta. It was cooked until rendered and crispy – but not darkened. The onions and garlic were added to the pan and cooked down until softened. While the onions were cooking the egg yolks were beaten and the cheese was whisked in. A splash of wine was added to the onions. When the pasta was cooked it was added to the onion/pancetta mixture along with a bit of the pasta water. The water contains some of the starch and helps thicken the sauce. You can always add more later if you don’t have enough to loosen the sauce. The heat was turned off and the egg/cheese mixture was mixed with the pasta. Finally the chopped parsley and cracked black pepper were added. That’s it! Easy as pie and oh, so tasty.